Freestyle sessions are for advanced figure skaters who are training for competitions. During freestyle sessions, skaters have access to the sound system so that they may play their competition program music.During Freestyle sessions, it is expected that all individuals are aware of other skaters and coaches. First right-of-way should be given to a skater performing their program to music. Second right-of-way should be given to skaters in private lessons.To encourage independent working and proper training habits, parents are encouraged to sit in the stands and are not permitted to stand in the doorways. Special video and harness lessons are available on freestyle sessions. All coaches and skaters are expected to show respect and good sportsmanship at all times. 1. 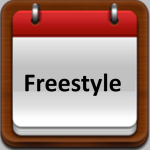 On morning Freestyles, skaters are to sign in on the “Freestyle Sign In” board prior to stepping on the ice. Types of payments are to be clarified as either “Fun Card (FC)” or cash/check. Cash/check payments are to be placed in the Cash Box placed directly on the board. On afternoon Freestyles, skaters are to sign in and pay at the Box Office before the session. 2. All fees must be paid prior to skating on Freestyle. 3. The Fun Card balance sheet is updated daily and posted on the board. Skaters who are found to have negative balances on their Fun Card are unable to skate until dues are paid. 4. 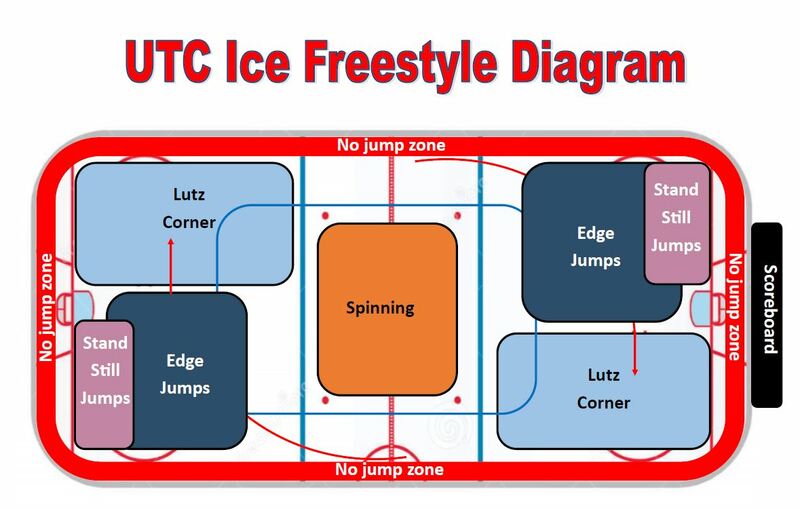 Freestyle sessions are permitted to UTC Ice coaches only unless authorized by UTC Ice Management and the Figure Skating Director. Pro fees are to be paid prior to stepping out on the ice. 1. Both skaters and coaches are to always be aware of jump patterns and programs. Standing idly in the middle is disruptive to the flow of the session – this must be avoided at all times. If a break is needed, please do so at the boards. 2. Limit the amount of talking to other skaters. Again, this is disruptive to everyone on the session. 4. Be understanding if another skater or coach gets in the way of your pattern. Everyone is always learning how to properly skate on Freestyle. 5. Everyone is responsible for keeping the ice clean. Discard all tissues, trash, etc. in garbage bins. 1. Program music is allowed during Freestyle. 2. An auxiliary cord is available to plug into devices such as phones, iPods, portable CD stereos, etc. b. Allow for other skaters and coaches who have not yet played their programs on the session. 4. Program belts are to be worn during routines. 1. Parents must view practice on the benches or lobby area, they are not allowed to interfere with Freestyle sessions by standing and talking at the entrance to the ice.